New Delhi: Political temperature of Delhi, the national capital, has soared after the BJP named former IPS officer Kiran Bedi as its CM candidate for upcoming Assembly elections in the state. 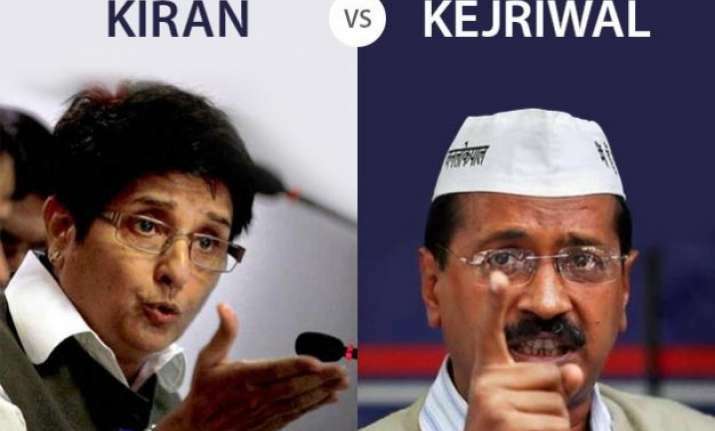 The stage is now set for a Kiran vs Kejriwal showoff in February 7 elections. Delhi may be a small state but being the national capital, the political developments concerning the state generates immense interest both inside as well as outside India. Every political party is trying to reach out to different sections of the electorate. Some political leaders are even resorting to identity politics to get electoral mileage in these elections. AAP supremo Arvin Kejriwal went to the extent of flaunting his ‘bania' background to make inroads into the trader community that accounts for nearly 8 percent of the electorate. Another AAP leader Ashutosh also publically disclosed his surname ‘Gupta' for the first time during Lok Sabha elections. According to 2011 census of India, population of Delhi was around 16,753,235. According to an estimate the population has touched a figure of 17,838,842 by 2014. Delhi Assembly has 70 seats and for a simple majority, a party needs to win at least 36 seats. Delhi Legislative Assembly was first constituted on 7 March 1952. The Assembly had 48 members, and a council of Minister in an advisory role to the Chief Commissioner of Delhi, although it was also empowered to frame laws. Chaudhary Brahm Prakash of Indian National Congress became the first Chief Minister of Delhi. Under States Reorganisation Act, 1956, Delhi was made a Union Territory under the direct administration of the President of India. Subsequently, the Delhi Municipal Corporation Act, 1957 was enacted which led to the formation the Municipal Corporation. In 1966, under “Delhi Administration Act, 1966", the assembly was replaced by the Delhi Metropolitan Council with 56 elected and 5 nominated members with the Lt. Governor of Delhi as its head. The Council however had no legislative powers, only an advisory role in the governance of Delhi and this set up functioned till 1990. In 1991, the parliament passed 69th constitution Amendment Act under which the council was replaced with Delhi Legislative Assembly. In 1993, Assembly elections were held in which BJP emerged victorious and Madan Lal Khurana became the Chief Minister. Khurana was replaced by his party leader Sahib Singh Verma who in turn was replaced by Sushma Swaraj just before 1998 Assembly elections. In 1998 Assembly elections, Congress emerged victorious and Sheila Dikshit was made the Chief Minister. Sheila dikshit created history by winning next two Assembly elections in 2003 and 2008. Her reign came to an end in 2013 Assembly elections when Aam Aadmi Party (AAP) led by Arvind Kejriwal, a product of Anna Hazare's anti-corruption movement, trounced Congress. Sheila Dikshit herself was defeated by Kejriwal from New Delhi Assembly constituency. Arvind Kejriwal formed the govt with support of Congress although he resigned within 49 days as he could not pass the Jan Lokpal Bill as he had promised to the electorate. Kejriwal resigned on 14 February 2014 and since then the state is under President's rule. The elections for the new Assembly will be held on February 7, 2015. Now let's try to understand who the major stakeholders are. If we look at electorate on the basis of religion then Hindus constitute around 81 percent of the population, Muslims around 12 percent, Sikhs 5 percent, Christians around 1 % and Jains around 1 percent. But there are distinct caste and social groups that hugely influence the outcome of these elections. Being the national capital, Punjab has got settlers from different parts of the country. The most important section among settlers is the Punjabis who are estimated to constitute around 35 percent of the population. But this ‘Punjabi' community is not a homogenous group and consists of different castes and religions. The most powerful section among Delhi electorate consists of Jats who constitute around 8 percent of the population. They are dominant in rural areas. According to an estimate, out of a total of 364 villages in Delhi, around 225 are Jat dominated. Jats dominate in around 20 percent of Assembly constituencies. Jats are mostly landed class and they known for flexing their muscles at the drop of a hat. Unauthorised colonies in North, South and West Delhi have significant Jat population and they play a major role in deciding electoral outcome in these areas. Similarly, people from Poorvanchal constitute a massive 24 percent of Delhi electorate. Poorvanchal mainly refers to the parts of eastern Uttar Pradesh and Bihar where Bhojpuri is the main language. According to an estimate, there are about 40 lakh people from Poorvanchal in Delhi. Some constituencies where people from Poorvanchal are in decisive numbers include Kirari (47%), Burari (44%), Uttam Nagar (40-42%), Sangam Vihar (40-42%), Badli (38%), Gokalpur (36%), Matiala (36%), Dwarka (34-36%), Nangloi (30-32%), Karawal Nagar(25-30%), Vikaspuri (35-40%) and Seemapuri (20-25%).